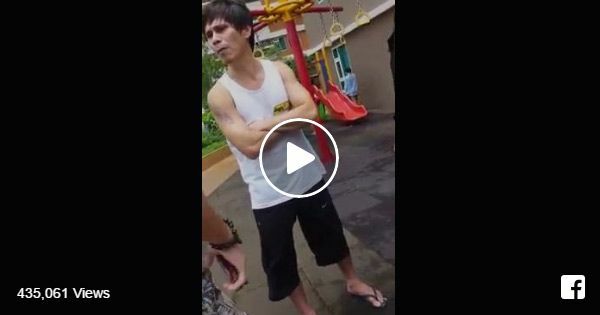 The man, identified by netizens as Louie Baltazar, angrily confronted the family and said taking videos and photos around the premises of the condominium is prohibited as it would compromise the safety and security of the residents. Based on the verbal altercation as captured in the 2-minute, 24-second clip, the OFW's son took a video for his blog site. When Baltazar approached and scolded them, the blogger promised to delete it and said he respects him. The family apologized and avoided the argument after the condo unit owner chided them for failing to read a certain book stating the rules and regulations of the condominium. Baltazar also humiliated a child of the OFW for using a children's toy on the playgound. The incident took place last Sunday, July 31, a day before the OFW left her family to work abroad. In one Facebook page, the viral video got nearly half a million views and thousands of shares as of 8 a.m. today. Social media users who commented on it critized Baltazar for his attitude toward the family, with some calling him "arrogant" and "ill-mannered."